I attended the 2008 Screenwriters expo at the Los Angeles Convention Center. If you aren't acquainted with this event, it brings together world-class speakers, seminars, software and an opportunity to pitch your screenplay directly to agents, managers and producers as well as studios. I happened across a booth for Pitchq. 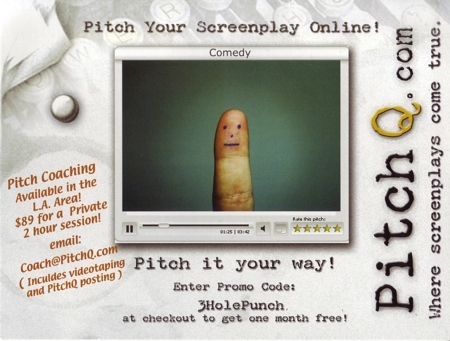 They put screenwriter's pitchs online via video.Now, as you may or may not know, this is something I know a little about.I had done my own YouTube pitch about a year ago, handling my own sound lighting and direction and all I can say about it was… the task was daunting.Aside from that project, I have had plenty of time in front of and behind a camera.Aside from twenty something years in the music business, producing a movie that was theatrically distributed, broadcast, etc., I recently started a reality series on YouTube - last July (my channel is called The Mackinaw Mill Creek Camping Show). When I heard that there was a “convention special” that involved Pitchq offering their services for free for the first month - I decided to give it a shot.They had a nifty padded booth which kept out most of the convention chatter, and I have to admit, a lot of the reason I wanted to try it was to get a closer look at their LED production lights.I'm a giz guy, I admit it. The way you want to arrive at one of these events is rested and with your pitch completely rehearsed.I arrived at the convention frazzled having spent the previous 10 days completely rewriting my 120 page screenplay.Add to that complication the fact that I was finishing 12 months on a medication that had a side effect of completely rendering my short-term memory useless as well as having intermittent hallucinogenic effects (no not that medication! ), - and you have an idea of the challenge I was facing. When you "pitch" you are expected to have a well worn three to five minute "little" act to perform.When you give your pitch on video, you don't want to be reading off of 3 x 5 or cue cards.Knowing this, I waited until my second day of pitches at the convention. I figured I'd have burned a few pathways in my neurons by then. Back to my story - so after ducking into the booth and dropping the padded curtain, the Pitchq team took over.They adjusted my collar, made sure I didn't stick to the background by backlighting me, adjusted the camera, microphone and sound.Then came the most surprising and wonderful part - I got the benefit of "spot on" and very professional direction (which I am eternally grateful for). Having been an entertainment professional, I wasn't used to stepping into this type of the situation feeling so discombobulated.After the day’s rehearsal I should have been "ready to roll," but in this case...Imagine if someone slipped acid into the punch two hours before you had to give the State of the Union address.Since I have been learning to fight the effects of this pharmaceutical for about a year, I can almost pull off faking looking normal without most people noticing. If someone is watching closely they might think I am learning disabled. I didn't warn my victims at Pitchq, after all, The Show Must Go On! Even though the booth was small, the gentleman holding my backlight (and I apologize for not having his name as he truly is a wonderful director and pitch coach, not to mention a superb backlight clamp), the other gentleman/camera/computer/sound tech and I had all breathed same air about 30 times over when I finally made it all away through my pitch without screwing it up -- they never lost their calm vibe, or their ability to make me feel like they were there to be on my side. After my first month I will need to pay a monthly fee to keep my pitch on the site.There are several benefits to having it hosted on the Pitchq site that aren’t available on YouTube.For instance, being able to put specifics about your characters, character breakdown, genre, production breakdown, etc.If you are new to screenwriting you opt to know that being able to search for these types of specifics can be very important to a producer. I learned a lot of things at the screenwriters expo, probably the most surprising fact was that four out of 10 movies made are written by first time screenwriters.I have to say, after pitching my screenplay to 17 production companies/studios/agents I will never be afraid of anything ever again. If you want to see how my pitch turned out, go to Pitchq and search for Rogalain the “keywords”.While you are there, check out a few of the other great pitches and if you know anyone in the “industry” let them know if you see anything you see that you think is great! I go to see Mr. Dr. man in about 10 days. He said he is going to start backing me off these med’s!I will get to see how easy the rest of you have it! It will be nice not having to triple check everything I do anymore. While you are at the Pitchq site, check out a few of the other pitches and if you know anyone in the “industry” let them know about the Pitchq site!